This is an adorable double 6 inch round TinkerBell cake. I used fondant and a Wilton impression mat to create the green layer of leaves for Tinker Bell to sit on. The impression mat was very user friendly. I rolled out the fondant like normal (I like the Don’s fondant) and then you place the impression mat over the fondant. Then I pressed down on the mat creating the impression. I left the fondant attached to the mat then I lifted the mat and fondant and covered the cake. Hint, dirty ice the cake first so the fondant will have something to stick to. I used a Tinker Bell cupcake topper for the Tinker Bell image. The rest of the cake was fully edible. 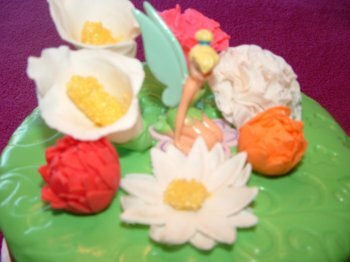 I hid Tinker Bell in a bouquet of edible flowers using fondant, gum paste, spaghetti noodles and edible glitter. I hid her in calla lilies, roses, carnations, daisies and mums. 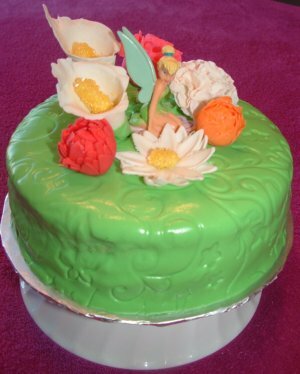 This was a delightful dainty Tinker Bell birthday cake.